Garbini & Garbini is currently preparing the landscape architectural design for the new Badger Forest Fire Station in Tulare County, California. Scope of work includes conceptual landscape graphics for staff and public meetings, coordination with architect and city staff, irrigation and planting construction documents and written specifications and construction administration. The landscape was designed to feature and protect a grinding stone used by Native Americans. 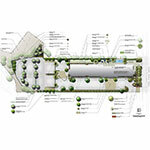 New landscape plantings consist of an all locally-native palette of trees, shrubs, and colorful perennials. Areas adjacent to the fire station will include low-maintenance inorganic surfacing; including cobbles, decomposed granite and boulders. Areas away from the fire station will feature native trees that are to be protected-in-place and a native hydroseed mix in areas disturbed by construction activities. Non-native tree species will be removed. The landscape should need no supplemental water upon establishment.